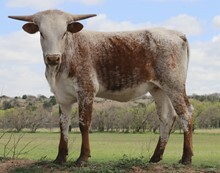 Many thanks to our wonderful friends, Brian and Suzanne Brett for consigning this elite cow to the 2019 Blue Ridge Sale. She is just a sweet as she is beautiful. We look forward to a 2019 fall calf by BR Cracker Jack. Tip to Tip 85.2500 03/31/2019 Dalgood's Prediction 91.36"